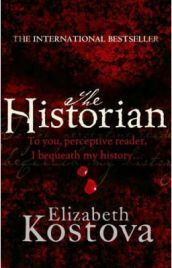 The Historian by Elizabeth Kostova is a vampire novel, but not in the same way as all the other vampire novels we see these days. The Historian is about several people who have researched and followed the myth of Vlad Dracul, otherwise known as Dracula, throughout the twentieth century. The overriding narrator is the teenage girl, who remains nameless. She is a very clever girl, well versed in history and languages. She lives with her American father, Paul, in Amsterdam; her mother is no longer with them. Much of the story is told by her father as he tells it to her, and there are also portions from an old university colleague of his, Professor Rossi – these are mainly in letter form, told by the father to his daughter in the course of his story. The three stories take place in different time periods: Rossi’s in the 1920s/1930s, Paul’s (and some of Rossi’s) in the 1950s, and the girl’s in the 1970s. They are all searching for Dracula’s tomb, traditionally believed to be in Snagov in Romania, but this is not the case. The search for information is difficult and dangerous. They have all become ensnared in the Dracula myth, and the possibility that Dracula may still walk the earth. The story’s timeline is complex, and at times confusing to follow. It is all in first person, and although the main narrator is the girl, her father sections are told to her by him, so he becomes the narrator for these. I’m unsure as to who is the historian of the title – it could refer to all three of them. There is a fascinating amount of history in the novel. From the little that I know, the details given about Vlad Tepes life in Wallachia (Romania) and his treatment of his own people and wars with the Byzantines are accurate. The Historian is excellently written. It is compelling, and draws you in – much like the legends that the characters themselves are pursuing. You will find yourself reading it everywhere you can. The story of Dracula is introduced very early on, and so the whole book has an undercurrent of tension and fear running through it. There are small startling events, throughout, and plenty of buildups of the tension through historical research. The tension and the accompanying fear almost reach breaking point before there is a breathtakingly scary, shocking and surprising turn of events. It took me completely by surprise; I couldn’t quite take it in. I was barely breathing in the run up to it, and then I had to read the same few pages several times to really take it in. I was on a bus at the time, and I looked up after reading this section and was baffled to find myself in such a normal place! This change of pace and climax to the very long build up of the novel really sideswiped me, and it is brilliantly crafted by Kostova. The Historian is not, however, a vampire novel in the true sense of the word. It is certainly no Twilight, and it is not a traditional novel in that it is not really about vampires. It is about humans who are seeking the truth about an ancient myth, yet there is of course an element of the supernatural in the events which they find happening to them. The fear is created predominately by the research, the telling of the old stories and the hints of Dracula within them, and simply by the fact that the characters are delving deeply into something which is almost taboo, something which people do not like to consider the possibility of. The fact that supernatural activity is not out in the open or even that clear adds to the fear, as the hints build up the tension much more than it would if we were simply confronted with a world of vampires. The Historian is a brilliant novel. It quite literally took my breath away, left me shaken and peering over my shoulder – yet at no point did I consider stopping reading, I could not read fast enough to find out what was going to happen next. I cannot recommend it highly enough. No Comments on "The Historian"